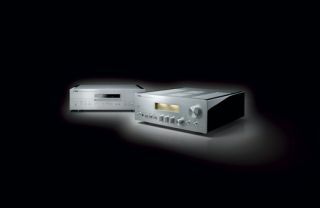 Yamaha unveils A-S2100 high-end Integrated Amp and CD-S2100 CD/SACD Player | What Hi-Fi? Yamaha has announced its new range of High End Hi-Fi: the A-S2100 high end Stereo Integrated Amplifier and the CD-S2100 CD/SACD Player with USB DAC designed by Steinberg for Yamaha. The A-S2100 features Yamaha's Floating and Balanced Power Amplifier technology. Yamaha claims floating the circuit from the ground removes "any negative impact of minute fluctuations or ground noise." Being a balanced circuit design, the A-S2100 adopts output elements with the same polarity on the plus and minus sides of the output stage. This design aims to reduce "sound quality variations due to difference in polarity." The Negative Feedback circuit and power supply are also separated - the power supply is floated - which results in a "thoroughly symmetric push-pull operation of the output stage." Again, this aims to remove any noise interference. The A-S2100 features MOSFET amplification, meaning it can deliver a similar, warm sound as with valve amplification, but without the expense and fragility. The CD-S2100 meanwhile features a new high-precision drive mechanism which aims to eleminate jitter and unwanted noise from the disc. Also onboard is a USB DAC which has been designed by German manufacturer, Steinberg. The DAC works in tandem with a high-res 32-bit ESS SABRE DAC for a "truly phenomenal and expressive sound from USB and digital sources." Digital and analogue circuitry within the CD-S2100 has been separated, with independent power supplies for each side. This results in an "exceptionally clear, low-noise reproduction of analogue audio." The analogue power transformer is toroidal, with a winding, stabilised power supply circuit which isolates the left and right sides. Both the A-S2100 and CD-S2100 will be available from Summer 2014 for £1700 and £1600 respectively.